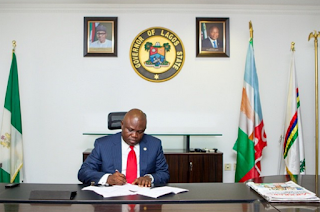 Governor Akinwunmi Ambode of Lagos state has abolished the Ministry of Rural Development and the Parastatal Monitoring Office, PMO and scrap other offices and agencies. The governor, through an Executive Order he personally signed and dated 17 June, 2015 ordered that the Ministry of Rural Development and the PMO be abolished while the office of Political and Legislative Powers Bureau have been scrapped and merged with the new Office of Civic Engagement. The governor ordered the scope of responsibility of the Ministry of Local Government and Chieftaincy Affairs be expanded with the addition of the mandate of Community Development, adding that the agency is now rechristened Ministry of Local Government and Community Affairs. The Community Development that used to be under the defunct Rural Ministry is now taken over by the Local Government Ministry, which led to its being renamed Ministry of Local Government and Community Affairs. In the executive order, the Office of Transformation has been renamed Office of Transformation, Creativity and Innovation and now placed under the purview of the Office of Head of Service. Ambode added that the mandates of the Debt Management Office and Office of the Special Adviser on Taxation and Revenue had been re-assigned to the Ministry of Finance. The governor ordered that the former Ministry of Tourism and Inter-Governmental Relations be relieved of the Inter-Governmental Relations mandate, saying that “conversely, the Arts and Culture schedules of the hitherto Ministry of Home Affairs and Culture be added to that of the Ministry of Tourism. “It is now to be known and addressed as the Ministry of Tourism, Arts and Culture. The Inter-Governmental Relations mandate hitherto assigned to the Ministry of Tourism is now added to the schedules of the Ministry of Special Duties; it is now rechristened the Ministry of Special Duties and Inter-Governmental Relations. “The hitherto distinct responsibilities of the Office of Drainage Services and Office of Environmental Services have been merged. The hitherto distinct responsibilities of the Office of Works and Office of Infrastructure have been merged,” he ordered. According to Ambode, all ministries assigned the responsibility of superintending over some Parastatals and Boards would henceforth sorely undertake such erstwhile responsibilities of the defunct PMO on such parastatals, agencies and boards. “The new mandates which clearly highlight the assigned ministerial responsibilities of MDAs have been approved for use henceforth. The Head of Service should effect necessary realignment of office allocation and redistribution of human resources in line with new structure,” he said. Also, with the new alignment, the Office of Chief of Staff, Lands Bureau, Land Use Allocation Committee and the new Office of Overseas Affairs and Investment (Lagos Global) have been brought under the Office of the Governor. The governor also created a new ministry named: Ministry of Wealth Creation and Employment, while the Ministry of Youth, Sports and Social Development has been renamed Ministry of Youth and Social Development, as a separate portfolio had been created for sports, which is the Lagos State Sports Commission.